For attaching to teat to deliver formula. I much prefer using a glass syringe to deliver formula than a bottle or plastic syringe. It slides freely, and does not catch and stick like a plastic syringe can, and you can control the flow which is impossible with a bottle, ie you can hold the plunger back to slow flow or push it slightly to increase flow. As the plunger takes the place of the milk as the puppy drinks, there is no sudden rush of air in once the puppy lets go (as can happen with bottles). Increments are permanently etched on the glass and will not come off. Can be cleaned by boiling or cleaning with soapy water and a small bottle brush or by placing in baby bottle sterilising solution. 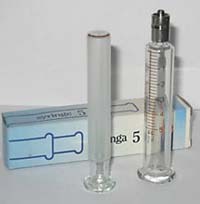 10ml size (actually holds 12ml but increments only marked to 10).